Most Australians plan to enjoy Christmas Day surrounded by family, swapping presents and indulging in a feast fit for a king, but for Sydney’s homeless, poor and at-risk families, Christmas is not necessarily a time of joy. 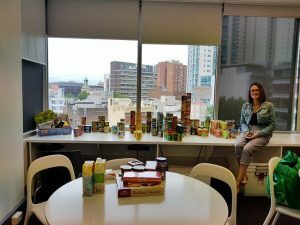 However, thanks to the initiative of TravelManagers Product Executive, Sandra Reucker, and the generous support of her colleagues at TravelManagers and Hoot Holidays, more than 300 cans of food have been donated to Sydney’s Exodus Foundation Christmas can drive and will be delivered to disadvantaged families around Sydney in time for Christmas. The items collected, which also included Coles gift cards, added up to a total estimated value of more than $750, with donations received from personal travel managers and staff from both Hoot Holidays and TravelManagers’ National Partnership Office. TravelManagers’ Executive General Manager, Michael Gazal, says Reucker’s commitment to supporting the Exodus Foundation over the past five years mirrors the company’s business philosophy of always going the extra mile. 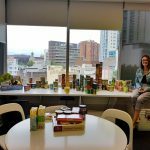 TravelManagers’ tea room served as temporary storage for 300+ food items collected by Sandra Reucker from TravelManagers and Hoot Holidays staff for the Exodus Foundation’s Christmas can food drive. Reucker says she was originally inspired to support the Exodus Foundation after watching a television documentary that featured its founder, Reverend Bill Crews, and the work carried out by the foundation in supporting needy families. 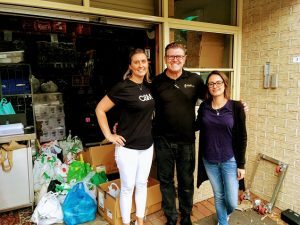 “They do such wonderful work within our community and it’s such a privilege to know that our contribution will help to bring smiles to some of Sydney’s disadvantaged families, even if it’s just for one day,” she says.